Nescient – lacking knowledge or awareness; ignorant; agnosticism. Isabel Kloumann and other mathematicians from the University of Vermont published a paper on positivity in the English language. So what are the happiest words in English? They might be nice to hear. But it turns out that positivity heaped on positivity becomes, like sugar or a giant clown smile, sickening after a point. To illustrate this problem, here are the top 20 words: laughter, happiness, love, happy, laughed, laugh, laughing, excellent, laughs, joy, successful, win, rainbow, smile, won, pleasure, smiled, rainbows, winning. As you go down the list in a binge of positive word reading, so many of the positive words start to sound crass (rich, diamonds, glory), treacly (butterflies, cupcakes, friends), or too obvious (positive, great, wonderful). . .
My 25 happiest words are: love, laughter, smile, family, friend, home, happiness, warm, compassion, gentle, book, music, sing, content, celebrate, satisfaction, secure, water, swim, walk, heal, well, fit, helping, sleep, and achieve. Hat tip: Beattie’s Book Blog. “Stormwater drains end up in creeks, and creeks end up in bays. Dog poo, litter, all end up in streams, and you might be swimming in the bay the next day,” said National Institute of Water and Atmospheric Research’s chief freshwater scientist, Clive Howard-Williams. Agriculture is often blamed for New Zealand’s declining water quality, but the country’s most polluted waterways are found in the inner city. . . This doesn’t excuse farmers from doing all they can to ensure their practices don’t pollute waterways but it does show improving water quality is an urban issue too. The biggest issue for cities is chemicals and organic matter being discarded down stormwater drains from individuals and light industry that eventually end up in the sea. “Paints, poisons and explosives are the things . . . that pollute beaches. At the end of the day a goldfish down the toilet is not going to do any harm,” McIlroy said. Even dog faeces and discarded ice creams contribute to the degradation of waterways and beaches. So does washing the car. “A lot of that sort of material causes the loss of oxygen, so fish in streams die. There is just too much organic matter and then you end up with bacteria in places where you swim,” Howard-Williams said. Many people believe stormwater is treated before it is fed into the sea, he said. It is not. “Stormwater drains play a fundamental role in removing floodwater. But the problem is that they end up in creeks, bays and lakes and it is untreated,” he said. Adverse publicity about rural water quality combined with education have prompted most farmers into taking a much more proactive approach to improving water quality. More publicity and education are needed to ensure urban people take responsibility for keeping water in towns and cities cleaner too. If you’re planning to make some New Year resolutions . . .
I’ve never been particularly serious about making New Year Resolutions, or keeping the few I’ve made. Resolutions I have made and kept to have been triggered by something other than the date. Smoking indoors in not allowed in any cafe in the country, but Tawera Park is the only one to be smokefree outdoors as well. It backs on to Tawera Park, which must be smokefree under the new policy of the three Northland councils, for smokefree parks, playgrounds and sports grounds. Ms Saramet says it was an easy decision to go completely smokefree. “It’s a nice clean green image to maintain, especially in Whangarei which is a lovely green place and I think we need to embrace that. I think it’s a benefit,” she says. . . The most compelling argument for not allowing smoking is the comfort of non-smoking customers. Unless smokers are very considerate smoke from their cigarettes drifts over other people. I’ve left a cafe before ordering because cigarette smoke from other diners was drifting in the open door. Smoking is legal but someone’s right to smoke is trumped by others’ right to smoke-free air. You’re welcome to look back or forward, discuss issues of the moment, to pontificate, ponder or point us to something of interest; to educate, elucidate or entertain, to muse or amuse. This red gurnard was collected by Charles Darwin when the Beagle visited the Bay of Islands. 1937 Noel Paul Stookey, American folk singer (Peter, Paul & Mary), was born. 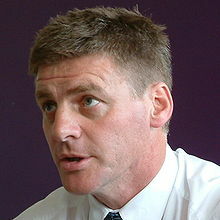 1961 – Bill English, New Zealand’s Deputy Prime Minister, was born. 2011 – – Owing to a change of time zone the day is skipped in Samoa and Tokelau. You are currently browsing the Homepaddock blog archives for the day Sunday, December 30th, 2012.